Craft beer has enjoyed a surge in popularity in Japan in recent years with the tipple now more available nationwide than ever before. Young compared to that of countries like the US and its beer-obsessed European cousins, the Japanese craft beer scene was born in the mid-1990s, when stringent brewing laws that allowed only large-scale brewing were relaxed; opening the door for smaller breweries to start brewing their own brands of beer. This series combines beer and travel, exploring the craft beer scenes in the cities and towns that have become major players in the nationwide movement. This first report explores the craft beer scene in Osaka, the economic powerhouse of Kansai and an old merchant city with a big appetite. Historically dubbed Kuidaoremachi, literally "eat until you drop town", this city immediately appealed to my taste buds and seemed as appropriate a place as any to begin my craft beer adventure. Arriving in the early evening and with a growling stomach, I was keen to make my first stop somewhere with hearty food to compliment a cool tipple. Luckily, Kamikaze in Osaka's Kitahorie district is renowned for its wide selection of beers from all over Japan and its delicious fare. For the first of many beers, I ordered an IPA by Minoh, Osaka's premier local craft brewery. For grub I got a pasta concoction with tomatoes and tripe. The beer and the dish were both delectable and reasonably priced, leaving me feeling full, slightly merry, and excited about what lay ahead. Another bar that blends beer and food particularly well is Craft Beer Spot Hathor in Kyobashi. A ten-minute jaunt from Kyobashi Station will land you at this cozy nook, wherein one can choose from any of 16 taps serving Japanese and international craft beer, and from a menu serving some great bar food. Following high recommendations, I opted to accompany my local beer with Hathor's signature dish, a whopping Chicago-style deep dish pizza. It was as filling as it was mouthwatering and left me with little doubt that in this town, food and beer are taken very seriously. I arose on my first full day in Osaka and immediately made my way to the quaint town of Minoh at the foot of northern Osaka's undulating mountains. Picturesque streets and beautiful nature aside, this town is revered as the home of Minoh Beer, Osaka's best-known craft beer brewery. I arrived at Minoh Beer Warehouse, Minoh's own bar and cafe just a stone's throw from the brewery, for a fresh pint and a chat with Oshita Kaori and Yahata Mayuko, the sisters legendary in the Japanese craft beer world who run the brewery. "We're celebrating our twentieth anniversary this year, and over the years we've seen a lot of change in Osaka's craft beer scene", Kaori-san tells me as I glance over at the wall to my right, on which are hung numerous awards taken at various international beer competitions. "In the last five years especially, lots of craft beer bars, bottle shops and brewpubs that produce their own beer have been popping up all over. The craft beer scene in Osaka is thriving, and it's great because everyone really supports each other; it's really great to be a part of it." Mayuko-san continued, revealing a little about Minoh Beer. "Our aim is to continue to make beer to the highest standard possible for our customers. One of the things that makes our beer special is the local water that we use for brewing. The nature in general is pristine up here. We have great water, great air and great fruit, not to mention monkeys that we use in our logo! We also brew a beer using the famous local yuzu." Needless to say, I tried the yuzu brew and am pleased to report that it was delectable; soft with subtle citrusy notes and an ideal partnership with the food served here. 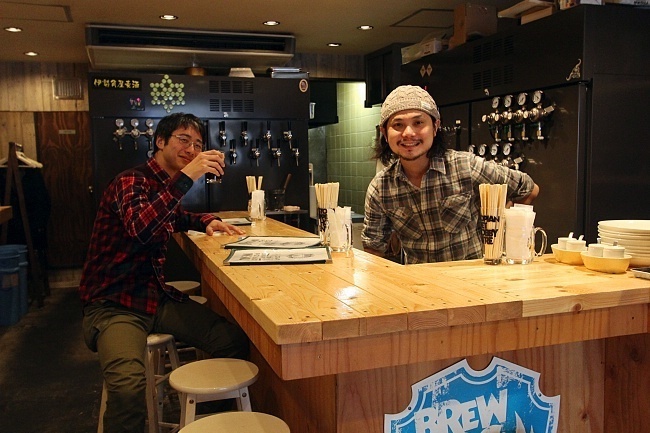 The chat in Minoh left me eager to visit one of the brewpubs that have sprung up around Osaka in recent times. After some asking around, I was directed to Beer Belly in Tosabori in the center of the city. Beer Belly is something of an institution of the Osaka craft beer scene, being one of the pioneering craft beer bars in the city. Since the summer of 2016, Beer Belly has been selling its own beer brewed on the premises. The bar's owner, Hachio-san, told me, "Brewing our own beer is difficult. It takes a lot of time, but it is worth it when we end up with great beer for our customers to drink". And great beer it was, added to a warm atmosphere that makes this bar well worth a visit if in town. It was time to visit another institution of the Osaka craft beer world, Craft Beer Base. Operated by Tani Ai, an ex-beer taster who studied beer at the Japan Craft Beer Association, this place is a true corner stone of the city's craft beer scene. The establishment serves as a bar and a bottle shop, with an extensive selection that Ai-san ships in from Japan and all over the world. Of course, there's the prized local stuff, too. I was lucky enough to be able to have a chat with Ai-san on my visit, and she told me her about craft beer and the scene in Osaka. "I think that it is important for people to realize just how much wonderful beer is out there. That has been my mission, to help people discover a beer that they love and that suits them, rather than everyone just drinking the same beers because they are the most available. The craft beer scene in Osaka is great. There is a real sense of community among everyone involved and we all support each other. I hope that craft beer's popularity will continue to increase, and that more and more places will start to serve it for their customers". Tani Ai is certainly taking steps to ensure the craft beer world becomes more accessible to those not yet initiated, with Craft Beer Base having set up shop in Hanshin, one of Osaka's premier department stores. Craft Beer Base Seed is a bottle shop that serves a wide selection of Japanese and international craft beers. More than merely a convenient place to pick up a bottle of beer not found at the convenience store though, this shop highlights the extent to which craft beer has grown in this city; to the point where it is now being seen and bought by people from all walks of life. Another of Osaka's highly-recommended bars that brews its own beer is Marca; an ultra-stylish tavern nestled amongst the fashion boutiques and cafes of Kitahorie. I sat down on one of the stools and ordered a glass of their brew, which, like the bar itself, turned out to be clean, cool and full of flavor. Looking towards the back of the room, I could see the brewing apparatus which, metallic and shiny, could pass as part of the sleek decor. The final place on my Osaka craft beer adventure, and one not to be missed when in these parts, was TNT in Taisho, in the west of the city. Foreign-owned, this bar and bottle shop fuses delicious Japanese and international craft beer with rock music and great bar food.